I saw Bille August’s “55 Steps” and Jon Avnet’s “Three Christs” the same morning and details of the two films are swimming and blending together in my head, and not only because they’re both based on important chronicles in the history of psychology. The former is about Eleanor Riese (Helena Bonham Carter), a mental institution patient who, in the 1980s, demands a lawyer in order to stop being overmedicated. Collette Hughes (Hilary Swank) is the lawyer who takes on her case, along with her mentor and legal partner Mort Cohen (Jeffrey Tambor), sue the hospital and go up several levels of judicial court before winning a landmark case that set a huge precedent for hundreds of thousands of patients to have the right to refuse treatment. “55 Steps” is the much more memorable film, because as much as it is about a very important ethical idea in the realm of medical treatment—the idea that a patient has enough cognitive ability to understand the risks in taking certain medications and the side effects they might have—"55 Steps” uses the bulk of its time to focus on the female friendship between Hughes and Riese. It’s a rarity for a legal drama to infuse its narrative with so much character development, especially two interesting, different women who are brought together under extraordinary circumstances. The dynamic is refreshing to watch in action: Carter plays Riese with a very open, warm, and idiosyncratic embrace, her passion in making rosaries is genuinely expressed, and Swank’s equally warm but more reserved and professional performance as Hughes makes her the even-keeled straight woman to Carter’s mischievous spirit. “55 Steps” also smartly addresses the issues that pro-bono cases like this one take on empathetic lawyers like Hughes, and how such selfless people are prone to forgetting about their own self-care. Some of the film’s narrative concerns, however, like Riese’s inability to understand the professional importance of Hughes’ valuable time, are clumsily written and feel quite boring, despite the necessity to explain how two people from very different worlds became good friends. Based on the book The Three Christs of Ypsilanti by social psychologist Milton Rokeach, the shorter-titled “Three Christs” doesn’t have the same kind of bonding friendship to help tether it like “55 Steps”. But it does have one too many relationships and characters. Richard Gere plays Dr. Alan Stone, the first health professional to experiment with the therapeutic treatments of schizophrenic patients. He puts three schizophrenic patients—played by Peter Dinklage, Walton Goggins, and Bradley Whitford—who all believe they are Jesus Christ into a daily group therapy session. The results are admittedly, somewhat funny, as the men try to break down the logic around how the other two are definitively not Jesus, while they most certainly are, but that kind of humor can’t sustain a whole movie. Instead, Gere’s character becomes, through voiceover, the kind of empathetic doctor who knows how to laugh at life. But three patients and a doctor—and Stone’s hospital administrator and research funder—are enough characters, yet “Three Christs” has on top of that, a wife for Stone, and a young, pretty research assistant to throw into the mix and make the narrative more complicated than it needs to be. Where “55 Steps” hones in on the important relationship between Riese and Hughes and the different ways they were able to help each other, “Three Christs” leaves it to Stone’s self-satisfied voiceover monologues and occasionally entertaining interactions with the patients as enough to build an entire narrative, but that never happens, and becomes easily forgettable. At least in those two movies, the professionals are able to help their clients. 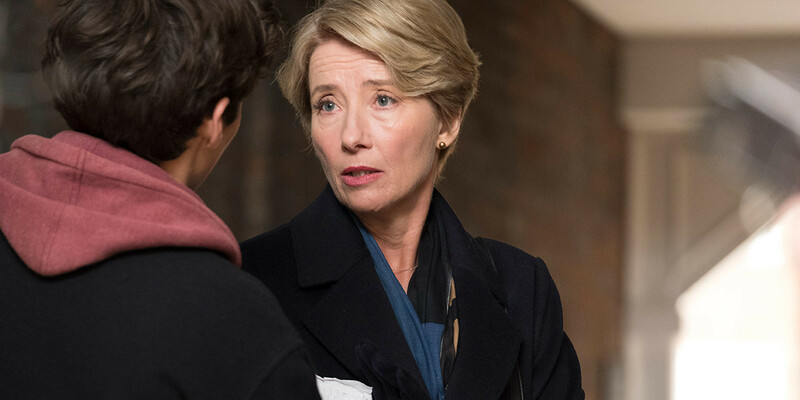 The supremely measured but ultimately disappointing “The Children Act,” directed by Richard Eyre, an adaptation by Ian McEwan from his novel, stars Emma Thompson as a British High Court judge. It’s the most effective of the three films in exploring a moral dilemma faced by the main character in their professional life while they ignore personal problems, but in the case of Thompson’s character, Fiona, she’s completely clueless when her professional and personal lives clash. Fiona is an excellent judge but the strain put on her marriage with Jack (Stanley Tucci) has him frankly discussing his desire to have an affair. Her solution? Don’t talk about marital problems, just kick him out of the house. The demanding pressures of Fiona’s job are one of the things “The Children Act” deals with effectively and with some humor through her meticulous assistant Nigel (Jason Watkins), who is the inadvertent target of her increasing anxiety on the job—like when she collides with his serving tea cup and he is scalded with hot liquid. Fiona becomes entangled in an extremely important and messy case involving a Jehovah’s Witness family’s desire to not give a blood transfusion to their under-age son Adam (Fionn Whitehead) in order to cure his leukemia. Fiona’s unusual decision to visit the sick teenage boy in the hospital in order to determine whether the lad’s not under the influence of his religious parents leads to an odd little friendship between the two, one that, after she saves his life from forcing him to receive the blood transfusion, becomes increasingly awkward and yet somewhat more life-fulfilling for the two over time, until Adam’s insistence to stay in touch pushes them into too-far territory. No spoilers here, but the ending feels far too abrupt, given the interesting issues it arises about gender disparity, consent in matters as complex as professional/personal friendships, and, like “55 Steps,” the grueling demands and sacrifices expected of high-stakes career women.